I first heard about Marie Kondo in 2015. A perpetually grumpy software engineer I knew would proudly carry her book around and talk about how much it was changing his life. The only time I saw him smile through his hoodie was when he was complaining about life or holding Marie Kondo’s book, The Life-Changing Magic of Tidying Up: The Japanese Art of Decluttering and Organizing. How could a book turn a pessimist into a joyful human, I thought, as I admired the beautiful cover. I felt a draw to the small book myself, but never made the purchase. Years went by. And one day, I realized my Twitter feed was full of people wanting to “Marie Kondo” every aspect of their digital lives. The tech community had gotten wind of Marie Kondo. And they wanted her to fix their lives. Plus, all their favorite apps. From storage tool Dropbox. To Chrome browser tabs. To boring cluttered analytics dashboards crowded with often befuddling data. Even Atlassian’s engineering ticket tool JIRA made the list. Marie Kondo’s method of tidying was the magic solution everyone has been craving to clean up their digital mess. Marie Kondo, but for in person meetings that could have simply been emails. People even began talking about Marie Kondo for unnecessary, time wasting meetings. 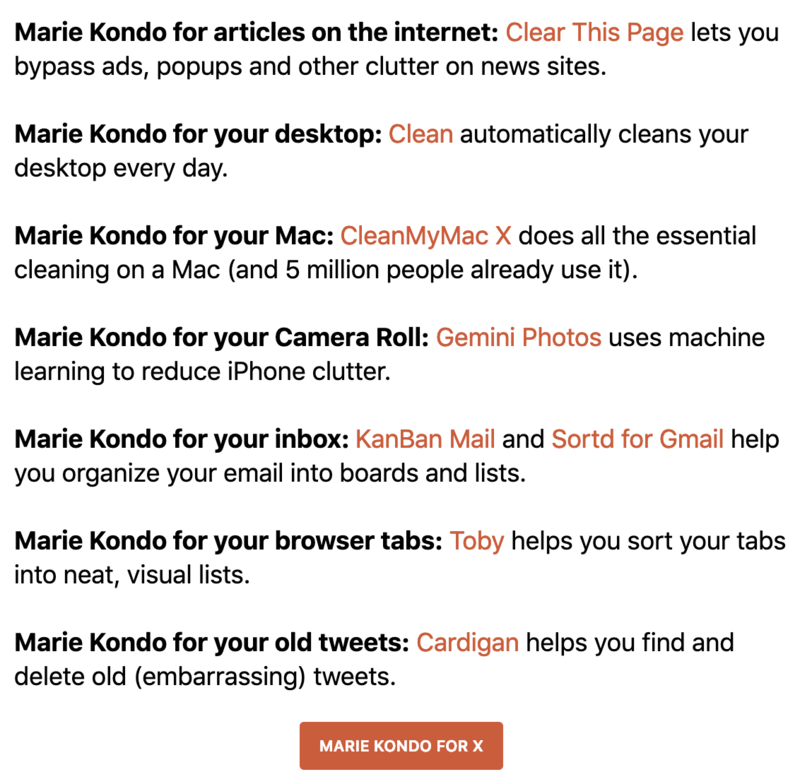 Popular product community Product Hunt devoted an entire email to “Marie Kondo for X,” which included a list of software tools that help clean up various aspects of your digital life. Our digital lives are a mess. The number one problem with documents is finding them. Our documents are everywhere, spread across more tools that we can count. When we need them, we often have to go on wild goose chases to find them, wading from document app to app, through folders, into task apps, through email and messaging apps, even asking our coworkers just to find the documents we need to get our work done. We constantly waste time trying to find documents instead of doing our jobs. Even the most organized one of us is not shielded from the digital mess. We’re all inundated with notifications that flash across our phones and computers constantly. Emails pile up, and it’s tough to sort through what’s important and what’s an email subscription you no longer get value from. Not to mention notifications from apps that hit our inboxes too, telling us that a new task has been created or that there’s been a comment on a document. Slack messages are constant, pinging us whenever there’s a new communication in channels we belong to or in our direct messages, across all the Slack workspaces we’re a member of. We get text messages from friends, family and colleagues throughout the day. Not to mention notifications from other chat apps like Whatsapp, Telegram, Facebook Messenger, Google Hangouts. Then there are customer communications. Thanks to tools like Drift and Intercom it’s easier than ever to talk to customers. It’s hugely valuable to have that direct line of communication with our customers. But for many, that means there’s a constant stream of customer requests, questions and bug reports that we juggle in addition to everything else that’s going on. 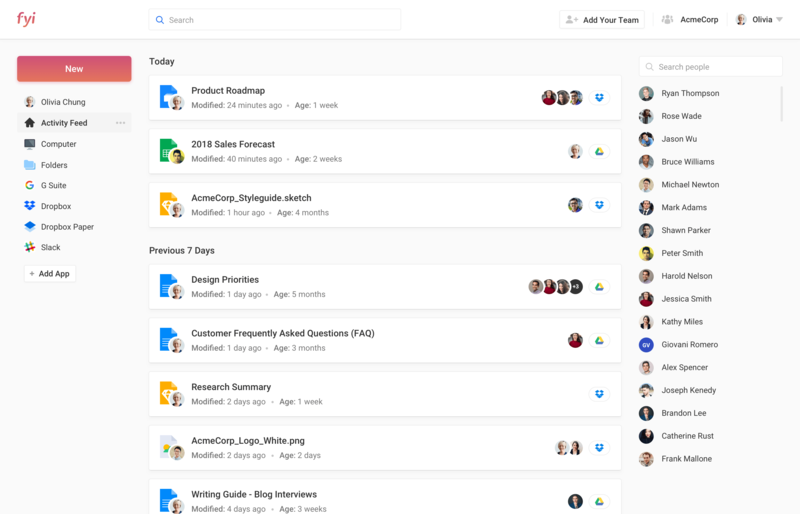 We’re also often collaborating in task and ticketing tools like Trello, JIRA, Github Issues, and Asana. These tasks pile up quickly, and we get notified in apps, browser notifications and via email as tasks are created, modified, and their status changes. On top of it all, we’ve got social accounts to deal with at work. Companies have Twitter accounts, and customers often tweet at the companies and the founders to share feedback. Linkedin, Facebook, even Instagram are used for work. That’s more notifications and more channels of communication to the customer. And then of course, we have our personal accounts that constantly ping us hour after hour. To manage the mountain of apps we’re using, almost every one of us has a corresponding mountain of browser tabs open. Just seeing the sea of browser tabs staring at us can induce anxiety. The list goes on. And on… And on. There’s so much noise in our digital lives that Apple had to add Screen Time to our phones to let us monitor how much time we’re spending on them. It turns out that on average, we’re spending about 4 hours and 15 minutes on our phones every single day. That’s a lot of time staring at a device that’s not even our computer. Screen time way up. Lots of late night/early morning time. Not good. This mess is exactly why everyone in tech is loving Marie Kondo right now. Just like a messy home, a messy work environment bombards us, stresses us out, and makes it more difficult for us to reach our goals. Marie Kondo has announced that she has a book coming to address these issues. It’s called Joy At Work: The Career-Changing Magic of Tidying Up and it’s coming out in spring 2020. After devoting the last two years to researching and helping tidy the digital mess most people live with every day at our company FYI, my co-founder Hiten and I decided we had to compile everything we’ve learned and the things we personally do to make sure we have joy at work. 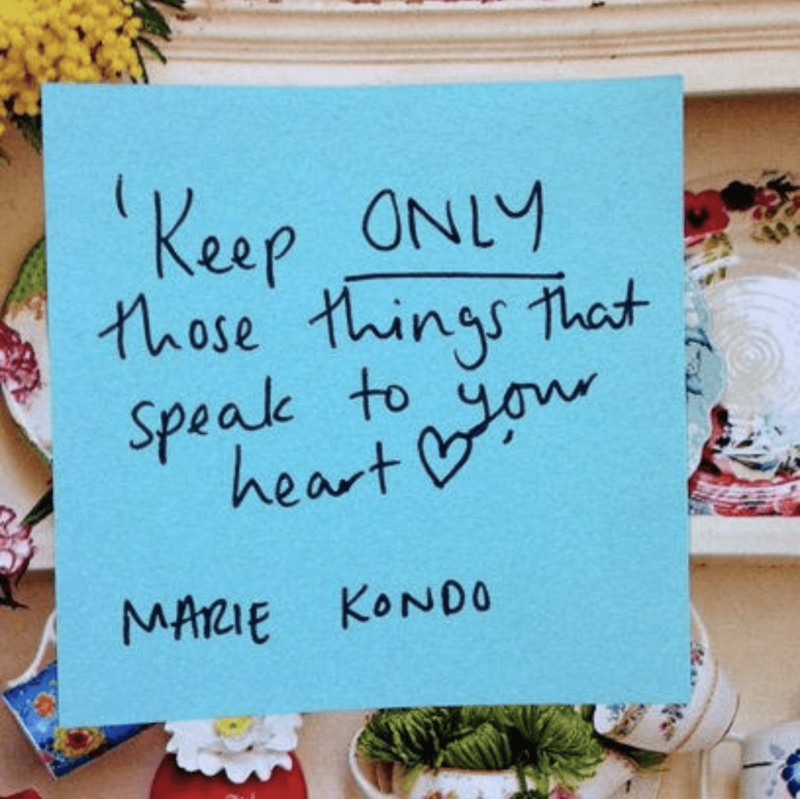 While you wait for Marie Kondo’s next book, we wanted to share what you can do now. Before we go into the details of how we use Marie Kondo’s methods at work, here’s a bit more about what her method actually is. 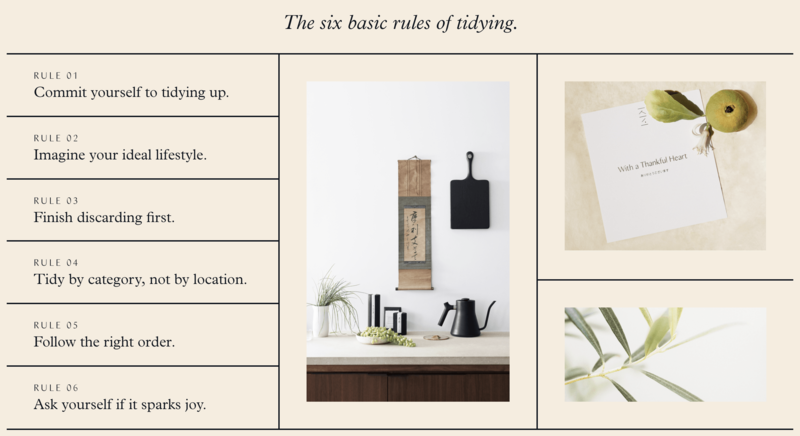 Marie Kondo’s tidying method is fairly simple and is based on six rules. Her advice is to take everything that you own in a particular category and put it all into one place so you can see it all in front of you and recognize just how much stuff you have. 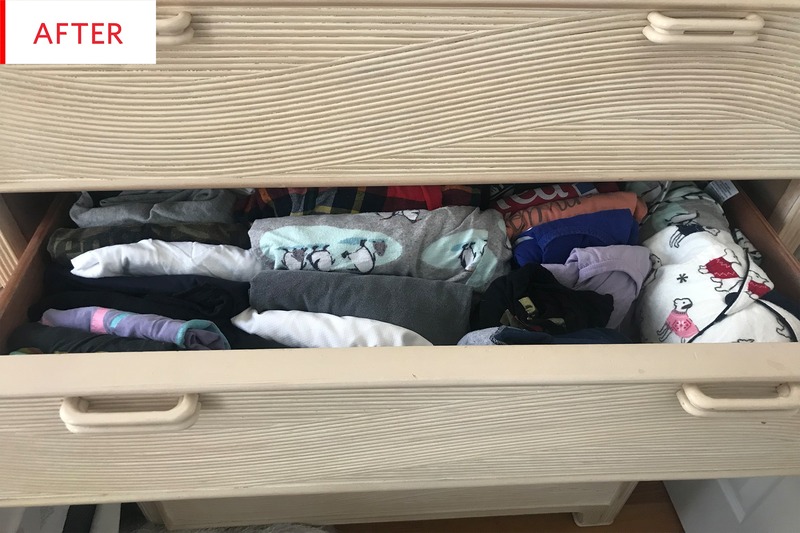 For example, with clothing you should remove it from your closets, shoe racks and anywhere else it lives and put it onto and around your bed so you can visually see that you’ve got more clothing than you need. Next, you pick up each item and ask yourself if it sparks joy. The idea isn’t to use your brain, but instead feel if the item sparks joy. If it doesn’t, you thank it for its service and put it aside for donation. For those items that you end up keeping, Marie Kondo advocates storing things in a manner where it’s easy to find them, with frequently used things staying in close reach. They should also be stored in a way that makes it easier to take them out. 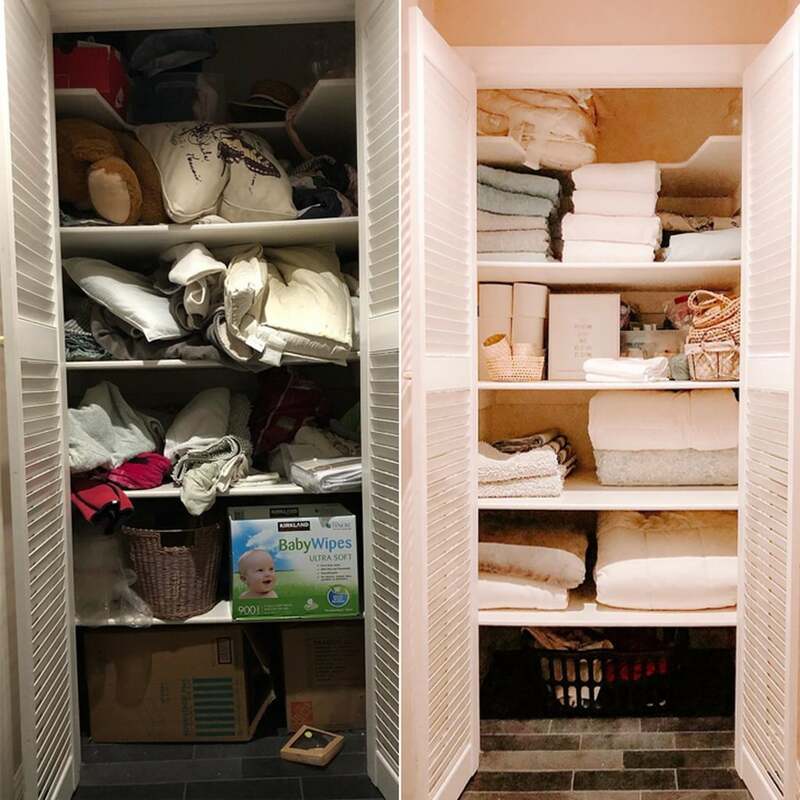 Her method advises using boxes, trays and bins and to organize items vertically so they can easily be seen. The entire method, according to Marie Kondo, can take from between a few hours to up to 6 months to complete. The idea is to do one big tidying sweep, keeping only the items that spark joy or serve a key purpose. For those with the discipline and fortitude to go through the entire process, the results are often larger than just changes to the home. With fewer objects that don’t make you happy in your space, the idea is that your life can transform. There’s more space for joy, happiness, and new things to come into your life. 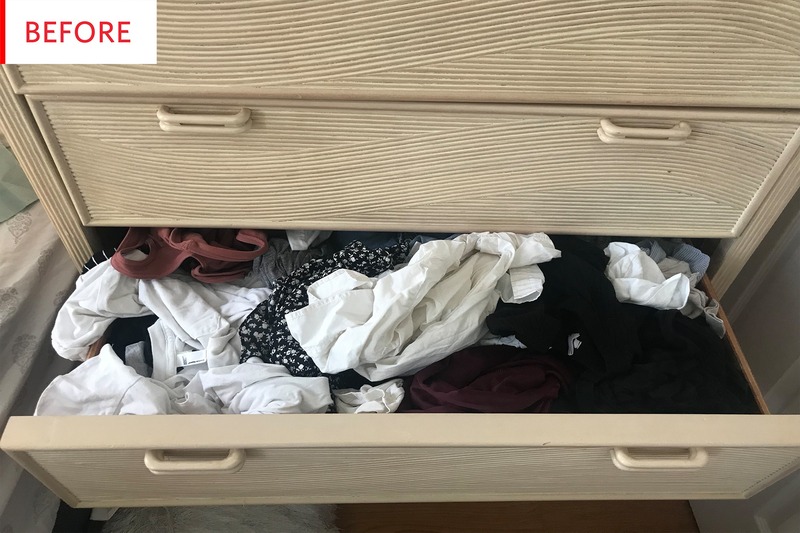 Between her books and Netflix show, the KonMari method has become so pervasive that thrift stores around the US have become overwhelmed with the sheer amount of donated items. And that’s just for cleaning the home. What about our work lives? Many of Marie Kondo’s clients want to move on to cleaning up their digital space after tidying up their homes. Her advice? Explore the same types of questions for your digital space as you would your home. She recommends deleting photos on your devices after reflecting which ones are the best, as we often have many similar photos on our phones. Hiten and I have been using a lot of tricks to stay sane and keep our digital lives organized. Why? Because given just how much information we are faced with on a daily basis, we have no choice but to declutter the digital mess in order to be happy at work. We also have our personal reasons. Hiten grew up in a Jain family that believed in letting go of possessions, both on a physical level and emotional one. On a regular basis his family would evaluate what they had and donate or throw away as much as they could. They would also abstain from certain specific foods that each of them loved. I’ve always sought to have as few possessions as possible to make moving easier, declutter my space and minimize my attachments. I’ve given up alcohol, coffee, meat, and gluten (aside from the occasional cheat) so that I can live a simpler life with fewer temptations and be kind to other beings. I also highly respect all the people and items in my life, and am grateful for their contributions to my happiness and learning. Naturally, Marie Kondo’s method appealed to both of us on a personal level. So Hiten and I sat down and collaborated on creating a list of habits that help us keep our work lives as joyful, clear and as simple as possible. We’ve organized them into categories and added checklists to make it easier for you to use them. 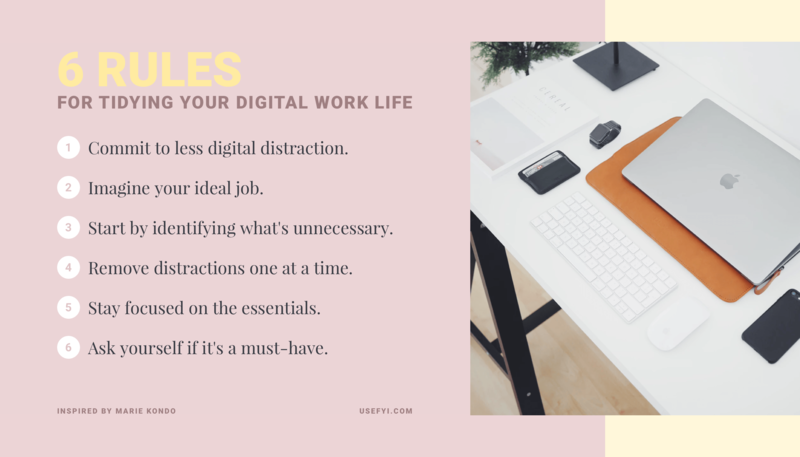 Inspired by Marie Kondo’s 6 rules for tidying, we created 6 rules for tidying your digital work life. Commit to less digital distraction. Start by identifying what’s unnecessary. Remove distractions one at a time. Ask yourself if it’s a must-have. We believe that like tidying the home, this process can take anywhere from a few hours to 6 months, as well as daily or weekly upkeep. Though it might feel overwhelming at first, tidying up your digital life will pay dividends on your peace of mind and wellbeing. Given the magnitude of our digital work lives, you can tidy in chunks that you tackle at the end of each day or every week instead of rushing to do it all at once. Here’s an in depth breakdown of how to tidy each digital category. For many of us, our cell phones are vitally important to getting work done. They go everywhere with us, and we’re attached to them day and night. While some of us have phones that are devoted to work, more often than not our work and personal lives live on one phone, crowded together and competing for attention. Am I happy with the contents of my phone? Does interacting with my phone bring me joy? How do I feel after I use my cell phone? Look at your phone. Does the outside of it bring you joy? If not, it may be time to discard your phone cover in favor of a new one. Remove any stickers you have on your phone case that aren’t bringing you joy. If you have been contemplating getting a new phone because your existing phone is buggy or you no longer enjoy using it, you can consider swapping out your phone. Look at the lock screen and the home screen images. Are they bringing you joy? If not, it’s time to change them. 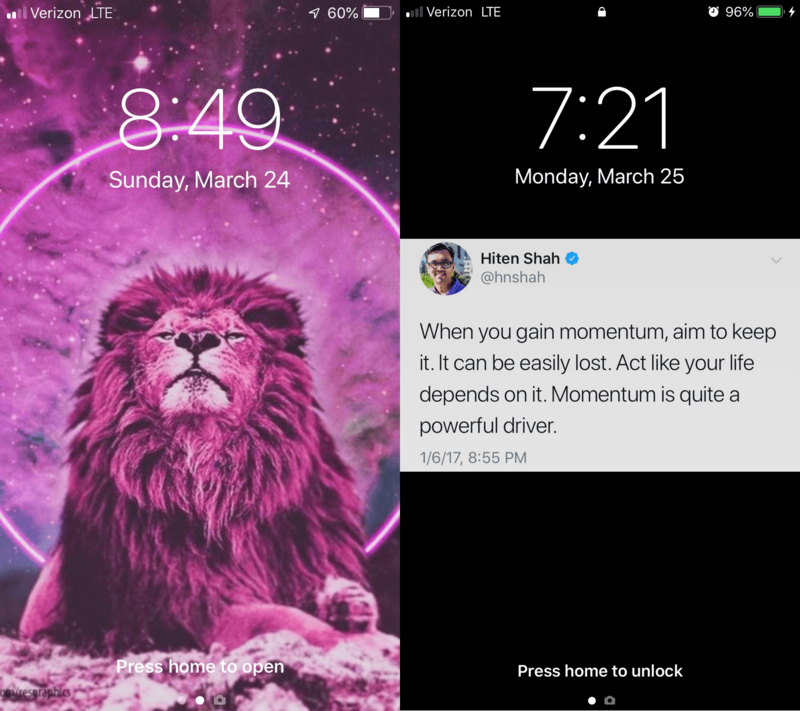 Hiten and I like to have inspirational quotes or images as our lockscreens. 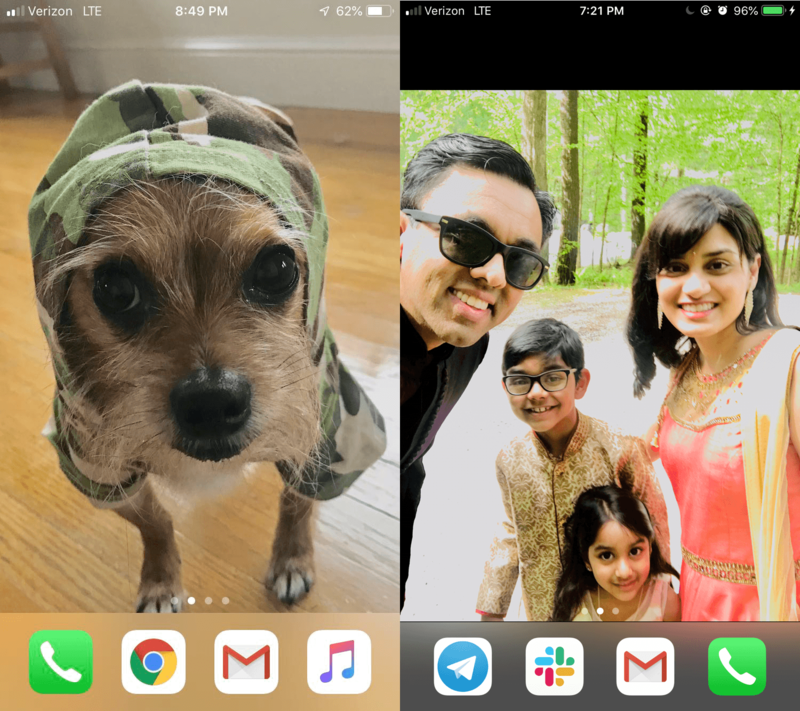 For the home screen, we suggest your favorite family photo – Hiten’s is a photo of his wife and kids, and mine is of my dog Ralph looking adorable. On to the apps. How does each one make you feel? Does it bring you joy? Does it have utility? Do you need to use it? The apps that don’t bring you joy and aren’t useful can be deleted. For both Hiten and I, when we find ourselves not using an app for 30 days and know that we won’t need it again, we delete it. The apps you don’t use multiple times a day should be organized by category in folders. When decluttering, get all your apps out of your folders so you can see them all at the same time. Then, re-organize them into simple folders so you can quickly access the apps you need. It’s just like putting all your clothes in one pile. Those apps that you’re using all the time can be easily accessible on their own and not reside in folders. Organizing your apps into folders will help you declutter your app screens. Since we tend to use multiple apps for the same things they can easily be grouped together – for example, Uber and Lyft, or Eat24 and Postmates. It’s simple to create folders they can all neatly sit in. If there are apps you use primarily for work, adding a Work folder can help you get to those apps fast. Organizing your apps in folders can help make your phone usage more intentional. By having all your apps organized in a few folders you’ll reduce the amount of apps you see on your app screen and thus limit temptations. We recommend keeping the first app screen on your phone blank. That way, when you open your phone you get to see the image on your homescreen without any apps to distract you. You’ll feel happier and spend less time getting sucked into apps and notifications you didn’t want to get sucked into. In total, we recommend having 1 screen of apps, with a maximum of 2. Once you go over 2 screens of apps it’s easy to forget where an app is and spend time searching for it and feeling frustrated. Marie Kondo has recommended deleting photos and only keeping those that bring you joy. While we agree with the premise, it’s easy to get overwhelmed by too many photos. For example, I have over 40,000 photos in my phone, primarily a mix of screenshots, food photos, selfies, friends, family and my dog. If I went through 100 of those photos a day it would take me 400 days to get through them all. And that doesn’t count the new photos that get taken daily. You can also consider storing older photos in the cloud or in folders on your computer, so you can keep your phone focused on the recent present. Even if you have too many photos from the past, it’s not too late to start cleaning your photos up. It’s easy to take a few minutes each day or a bit of time each week to delete the photos you no longer need. And a quick hack for deleting older photos on iPhones is to go into the “Screenshots” category and remove all the screenshots you don’t need. We are at the mercy of notifications on our cell phones, tablets and computers. We see them pour in and get a pleasurable dopamine hit each time. Or worse, we are filled with anxiety about something we have to rush to do. At their best, these notifications distract us, and at their worst they make us stressed, anxious, and even sad. Are my notifications bringing me joy? Do I need to see and respond to all the notifications I receive right away? Start with your phone. First, unless you have a job which requires you to be on top of email the second it comes in, turn off notifications on your email. You should also turn off notifications for personal email accounts, so you aren’t pinged constantly about every email that comes in. Next, turn off all notifications for your social media on your cell phone. Those notifications aren’t needed, unless social media is part of your job and you need to reply to comments in minutes, not hours. If you’re having trouble giving this one up, observe how you feel when you get notifications and go into the apps. If it’s not bringing you joy, turn the notifications off. Lastly, look through your list of app notifications. You’ll be surprised by just how many apps have notifications turned on. Turn off notifications for those apps where you don’t need a notification. If you encounter any resistance, remember that unnecessary notifications distract you from your work and from your life. For apps where you decide to keep notifications on, there is a way to turn off notifications during a specific time window on iOS. Go to Settings > Screen Time > and turn on Downtime. You can set hours when you won’t receive notifications from any apps except those you decide to allow. Once you’ve tackled your phone’s notifications, it’s time to move on to your computer. You’ll be surprised by how many notifications you have turned on when you look at your desktop notifications settings. Keep only those notifications that you need. The rest can be turned off so you have less information flying at you throughout your day. There are also ways to control which notifications you get from specific desktop apps. For example, in Slack you can choose to get notified about “All new messages” or receive fewer notifications, only seeing “Direct messages, mentions & keywords.” Go through your most used desktop apps that you need notifications from and see if you can reduce those notifications to only what’s absolutely necessary. If you use Chrome, you may have allowed certain websites to send you notifications. Check which ones are sending you notifications by going to Settings > Content Settings > Notifications. You’ll see which notifications you’ve blocked and allowed, and can remove unnecessary notifications. If you are receiving duplicate app notifications on your phone and on Chrome, you should be able to turn them off on one device and keep them on the other. For example, I had a food delivery app pinging me across Chrome and my phone, and was able to turn Chrome notifications off since I don’t need to receive notifications in both place. If you aren’t using Chrome, take a look at your browser and see which notifications you’ve allowed. Then, run through the same process of removing notifications you don’t need. We use dozens of apps every day. The second our phone alarms go off or we start checking our email, we’re in an app. The more apps we have and use, the more information we need to juggle. While many of our apps make us more productive, sometimes we’re using apps that don’t make us happy and don’t add value to our lives. Are the apps I use bringing me joy? Do I need all the apps I use? What apps am I not using that would bring me joy? It’s not always a joyful experience using apps for work. 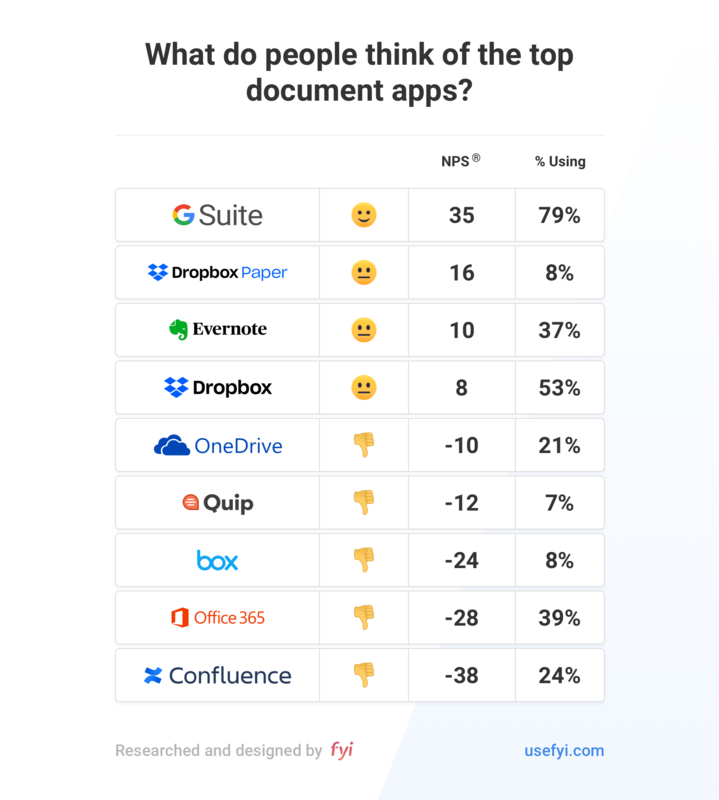 When we surveyed customers about the most popular document apps, we learned most people aren’t satisfied with them. 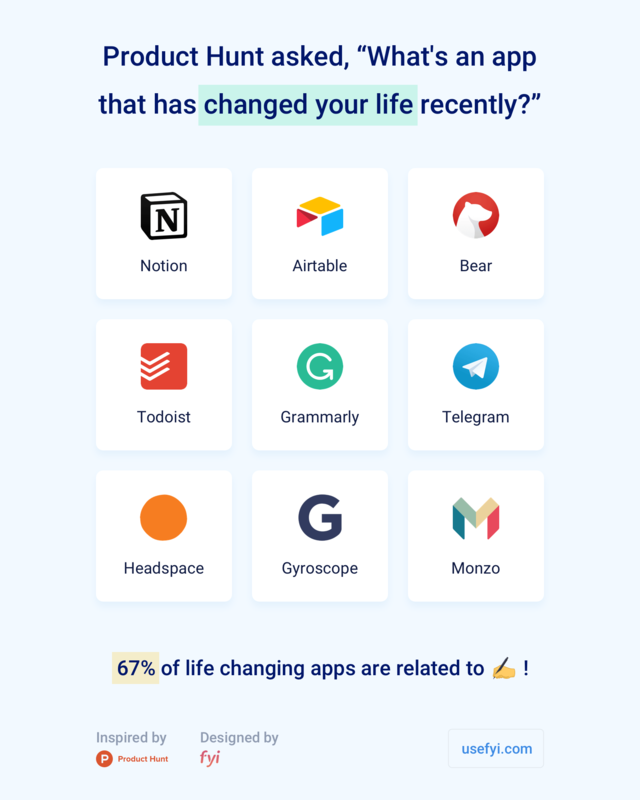 The Net Promoter Scores of these apps showed that only one app (G Suite) had satisfied customers. Even though these apps don’t have high customer satisfaction scores, they are vitally important to millions of people who use them on a daily basis to get work done. Oftentimes we have to use apps we don’t enjoy using because our company or team mandates their usage. There are things we can do to make even the worst app experience more enjoyable and joyful. For apps that let you, we suggest modifying the color scheme to one you prefer and trying dark mode. At our company FYI, the product team has its Slack set to colors that match our product’s logo colors. This helps get us motivated and excited to use Slack to get work done. Hiten and I also set our Mac OS to dark mode for a more relaxing ambiance. Another trick is to change your screen name to something that motivates and inspires you (if your work environment allows it). The are new apps and features being launched daily, many of which can make your life easier and create joy for your workday. Hiten and I also have a few favorite apps we recommend you check out if you’re not using them yet. I love writing, so I make sure to use a document tool I love writing in. For me, that tool is Google Docs. I typically use it on my laptop, but there’s a mobile app too that is incredibly helpful. I also live in Gmail. Love how simple Dropbox is to use on the web and on my laptop. I find Trello to be the cleanest and easiest to use task tool and though I typically use it on the web I am obsessed with how simple the mobile app is. I’m also a Slack-aholic (the desktop and mobile apps) and have the Google Drive app in my Slack on so I can get real-time document notifications. I use Google Calendar for meetings, love listening to Spotify while I work, and take breaks by perusing Twitter. And I use FYI all day to find my documents, of course 🙂 I have 10 different apps hooked up to it so I can quickly find what I need without having to jump between all those apps. For Hiten, the philosophy he grew up with of evaluating possessions and purging them has extended to his digital life, where the number of products he uses is reevaluated regularly and kept to the essentials. If something is no longer useful, he will stop using it. Here are Hiten’s favorite, essential apps: Beyond the Google products I mentioned, he uses Bear for note taking that syncs across every device he uses. He also uses Buffer for scheduling social media posts in advance so that he isn’t constantly on Twitter and LinkedIn. Unlike me, he’s a YouTube Premium subscriber (I haven’t been able to convert him to Spotify) and loves listening to YouTube videos in the background while he drives or works. And he can’t live without our product FYI because he has over 63,000 files in Dropbox and almost 9,000 in G Suite. The premise here is simple. If there are apps that you’re not using often, delete them. We go into this in more depth in the computer and cell phone sections. Our computers are where we get most of our work done. They are filled to the brim with information. And typically, totally disorganized. It’s easy to create a digital mess on your computer because it’s not a physical space you have to see and deal with. Even though the information and apps on our computers aren’t something we can hold and feel, our brains are still barraged by the mess every day. Am I happy with the contents of my computer? Does interacting with my computer bring me joy? How do I feel after I use my computer? Start by looking at your computer. As Marie Kondo suggests when you are tidying your home, recognize that your computer is an object that serves you day in and day out. Take a moment to feel the respect and gratitude you have for it. Now, decide what you can do to be happier using it. 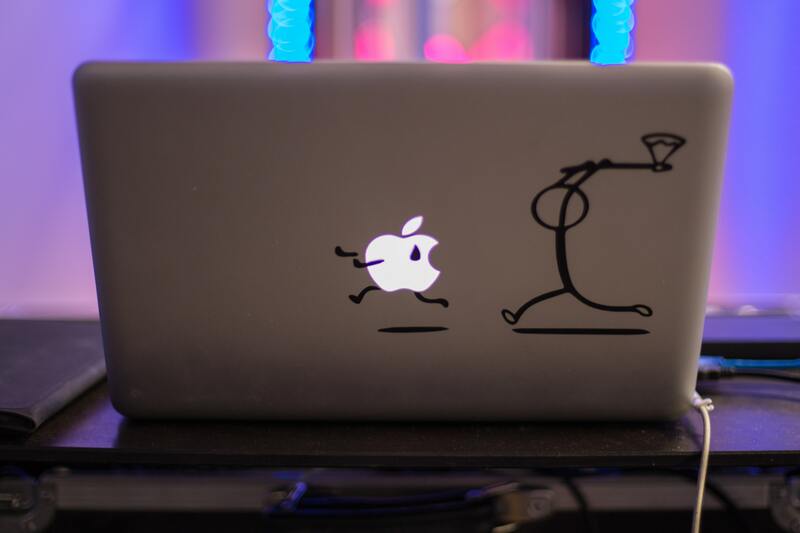 There are lots of things you can add to your computer, like stickers, keyboard covers, laptop covers. If you put something on your computer in the past, whether it’s stickers or a cover you don’t like, feel free to remove them. And of course, you should remember to clean your computer and the screen on a regular basis, since you are most likely using it constantly. Most people’s desktops are full of random documents and screenshots – whatever they happened to quickly put on there and then never cleaned up. To clean up our desktops, Hiten and I have the same bad habit. Once our desktops get completely covered in files, we grab everything and throw it into a folder called “Desktop” that we then never go back to again. It’s kind of like when you were a kid and your mom asked you to clean, so you just quickly shoved everything into the closet. A better way that does take a bit more time is to delete the files you don’t need that end up on you desktop. You can do a quick check at the end of each day or once a week and delete the files you no longer need. For those files that you do need, organize them into a folder where you can find them later. Something I like to do to help me have a little extra joy is to drop a few of my favorite photos onto my desktop. That way I can take a quick look at them when I need a pick me up. When you see the screensaver and desktop, you should feel calm and happy. 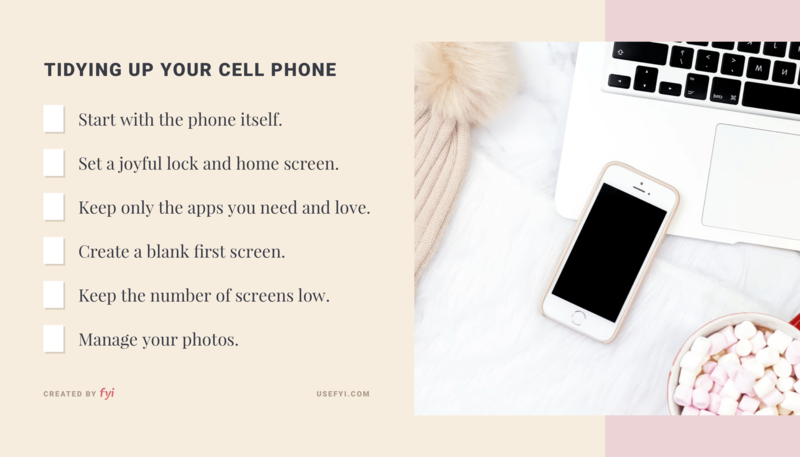 If your existing setup doesn’t do that, then just like with your cell phone, choose a screensaver that makes you happy or relaxed. 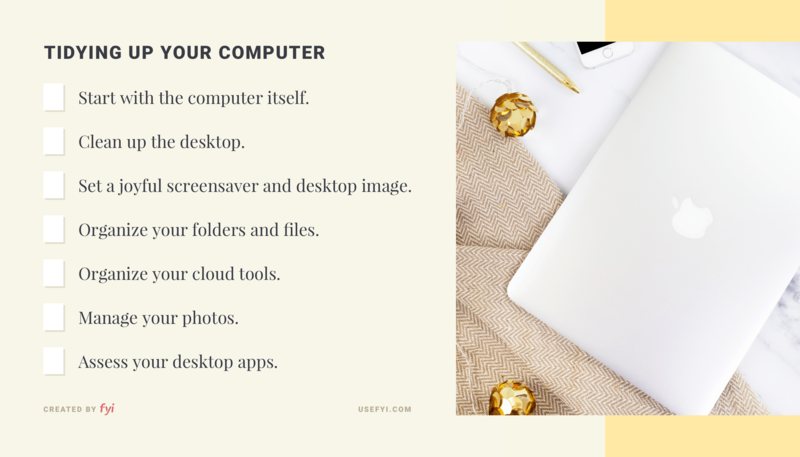 For your desktop image, choose something that motivates you while working, whether that’s a beautiful picture of a natural landscape, a family photo, or something minimal. 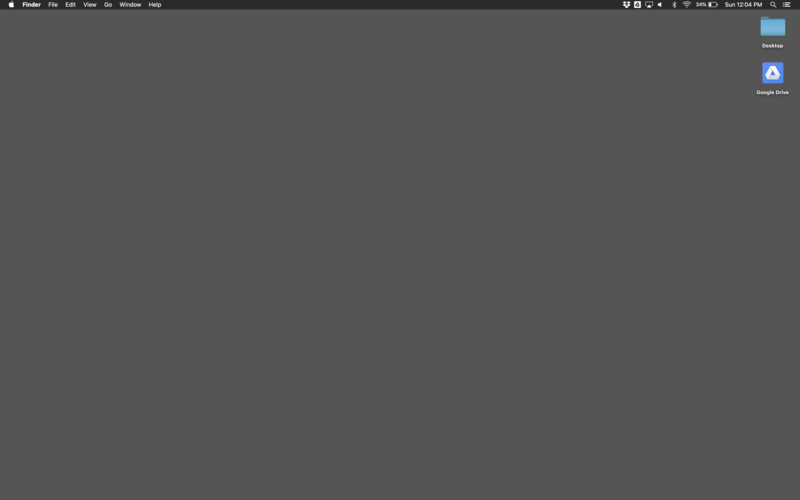 For his desktop image, Hiten chose a grey background to avoid distractions while working. 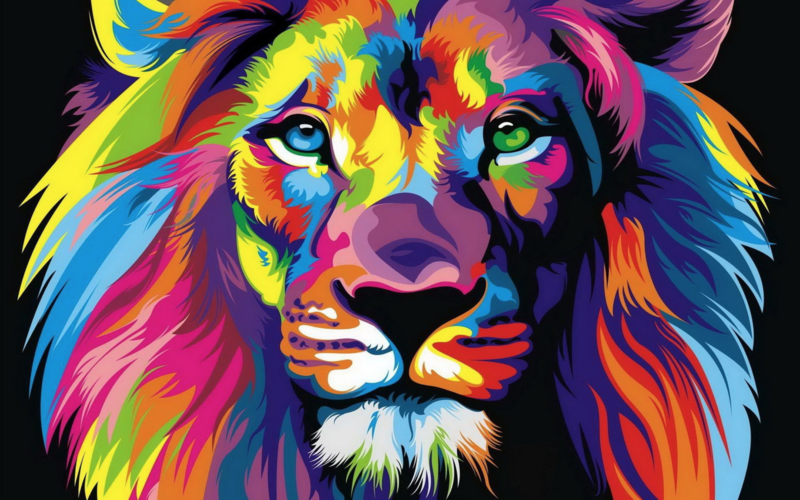 I’m on the other side of the spectrum and have another inspirational multi-colored lion on my desktop to help energize me while I’m working. You should make it a practice to have a clear way to organize the files in folders on your computer. Whatever files you have on your computer should be organized into folders, like marketing, strategy, personal, taxes, content. If you have multiple drafts of documents in folders, make sure to label the final draft by putting “Final” into the title. This should help you find the final draft much faster if you are navigating through folders. Deleting files you no longer need is also a practice that will help you tidy your computer. Admittedly, I don’t delete my computer files since as long as they aren’t disorganized I don’t see the harm in having them. Since it’s good practice to reduce the number of files you have, a rule of thumb should be to delete duplicate files and any drafts that you no longer need. If there are other files that you no longer need to retain for your records and you aren’t using, you should consider deleting them. Consult your company’s retention policy before deleting company files to make sure you are in compliance with it. This rule should be considered whenever you are deleting files, apps or emails that might have information you need to retain. Documents and files don’t just live on our computers. They’re in the cloud too. If you’re lucky, you’ve already organized your cloud files into folders. Or, you are required to follow a company naming and folder structure. But for many of us, our cloud based document tools are a mess. If you haven’t created a solid folder structure for your cloud based files, you should consider organizing them into folders. Remember that you’ll need to do this for each cloud based tool you use. For example, Google Drive, Dropbox, and Quip. You can also do the same thing you did when you reviewed your computer files, and review if there is anything you should delete. Again, this should be in accordance with your company’s retention policy. If you don’t have a retention policy, you should ask your manager before you delete files. Documents, particularly those that are cloud based, should most likely be retained for records unless you are told to delete them after a certain period of time based on company policy. Another way to get organized is to create a wiki, and link documents together in it. Based on our extensive research, wikis are not adequate solutions because not everyone in the organization ends up using them or going back to them. Plus, they take a ton of time and upkeep. Our favorite way to get organized is by using FYI. Just like the KonMari method, you start by getting all your documents in one place, regardless of where they happen to live. FYI will then organize your files for you across all the apps you use, and let you see them by document type, creator, and recent activity. Once you can see all of your files, you can discard what you don’t need. This gives you one location to keep organized instead of half a dozen. Just like with your cell phone, you can reduce photo clutter so you only retain photos that bring you joy. The easiest way to handle this is to sync your phone and computer so that you only have to delete photos in one place. For additional photos you have on your computer that aren’t on your phone, you can look through them and delete those that you don’t need or don’t like. You can do this in one fell swoop, or you can do it at the end of each day or week. The apps we have on our computers help us get work done. For example, my go-to desktop apps are Slack and FYI. If you have more than a few apps on your desktop, you should go through them to make sure that they have utility and/or bring you joy. You can delete those that don’t bring you joy and that you don’t need to get your work done. We’re buried in email, day after day. The average person receives 96 work emails per day and sends 30 emails out. That’s almost 700 work emails received a week! It’s easy to get buried in email and continue to stress about just how many you have. 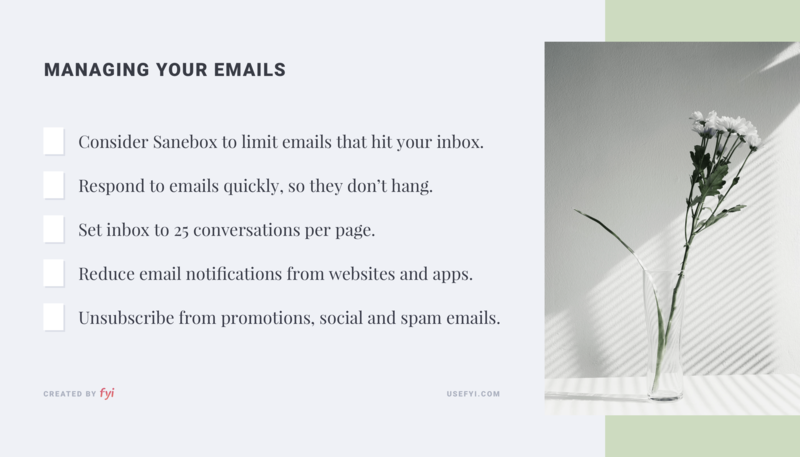 But there are simple solutions to clear out your inbox (and your mind). Am I getting joy from all my emails? I have to admit that my email is a mess. I’ve got over 17,000 unread emails in my inbox. Thankfully Hiten is an inbox 0 superstar and had tons of great suggestions for managing your email. What’s inbox 0? It’s when you have zero emails in your inbox and reach a magical zen flow state of relaxation. Here’s how Hiten does it. He has one secret weapon when it comes to email. Hiten has been using a service called Sanebox since 2011. He gets several hundred emails on any given day and with Sanebox only the most important ones get to his main inbox. The rest are automatically categorized, so he can just click on the different categories and view them whenever he has time. Two of his favorite categories are “SaneLater” which has every email that isn’t important for him to see right away and “SaneNoReplies,” which has all the emails he has sent that haven’t been replied to yet so he can follow up. Hiten also has a couple of email rules that he follows to help ensure his inbox stays at 0 as much as possible. If he checks an email he does his best to respond to it right away. This way he doesn’t spend any unnecessary time thinking about minor tasks later. I personally still feel guilty about emails I haven’t responded to from months ago. His inbox is set to show only 25 conversations per page cut in half from the default setting of 50. He makes sure that he has only one page of emails at any given time. It’s a way to prevent him from getting lazy about managing his email. 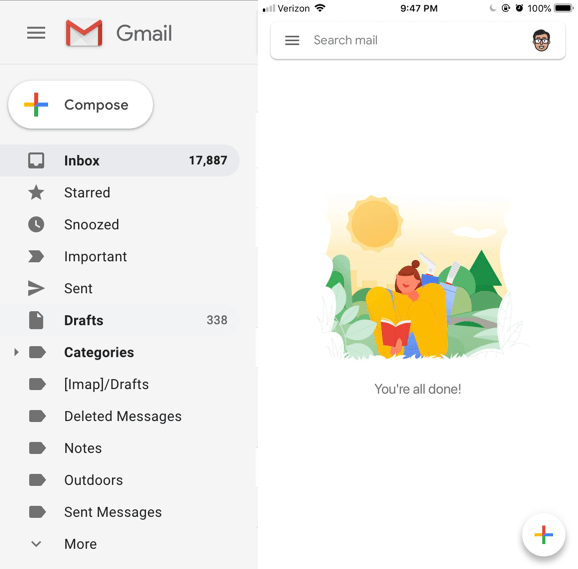 Recently there has been an up-and-coming new paid email client that many power users have been singing the praises of called Superhuman. Neither Hiten nor I have used it yet but it deserves an honorable mention because of how much people love it. Another trick is to go to specific websites you use and change your email notification settings. For example, you can change how often and if you receive emails from Trello. Facebook also lets you change your notifications, so if you use it for work you can specify how often you get emailed. Since I was receiving so many emails, I modified it so that I never get any emails from Facebook, which means I only see notifications when I visit Facebook itself. We get dozens of promotion emails, notification emails from social media, and spam emails daily. I counted mine up and saw that I receive about 18 of those emails per day, on average. That’s over 100 promotional emails in a week, most of which I don’t need. We suggest unsubscribing from the emails you don’t need. A great quick tool that will help you do that in just a few minutes is Leave Me Alone. Neither Hiten nor I have tried it yet but it’s been very popular amongst the Product Hunt community. You can also scan your emails and see which ones you don’t actually need. Ask yourself, does this email bring me joy? If the answer is no, unsubscribe. What’s next for our digital mess? The problem we’re facing at work is only getting worse with each day that passes. With all the new tools that come out every day, you’re inevitably going to be using more and more of them to help get work done. And then there’s everything you’re already using. The apps on your phone. The websites you visit every day. The software you’re using. All creating more and more notifications for you to deal with. Not to mention all those emails that hit your inbox every day. To manage all your digital mess, you’ve got to put real effort into tidying up or you’ll only continue to pile more on top of your existing mess. And it’ll continue to be out of control. 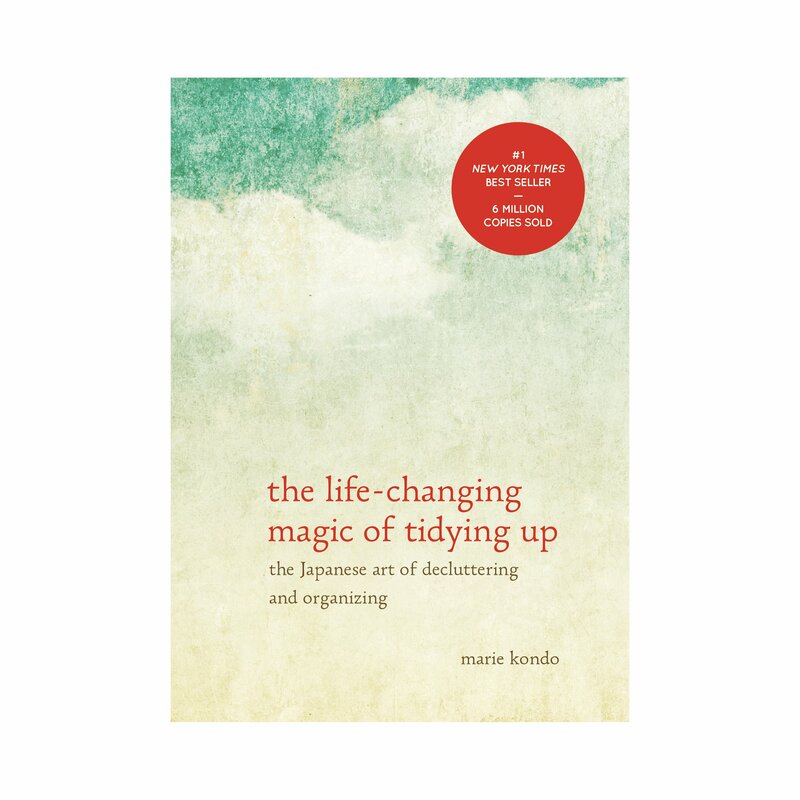 As you eagerly await Marie Kondo’s next book, Joy At Work: The Career-Changing Magic of Tidying Up, I hope I’ve inspired you to get started today tidying up your digital mess to find more joy at work. The FYI team and I are going to stay focused on bringing you more joy at work by building FYI to be the best way for you to find your documents in 3 clicks or less. 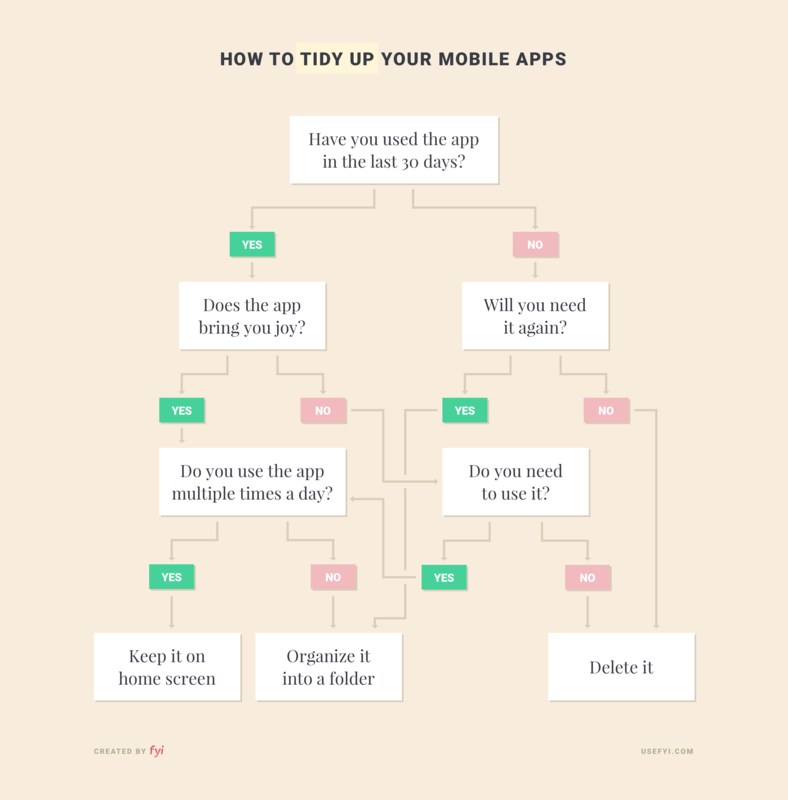 Do you have your own tips on tidying your digital life at work? Please share them in the comments!